Best Used Polaris ATV Models. Owner Favorites 2001 thru 2017. Best Used Polaris ATV Models. The results are in! We have our list of the best used Polaris ATV models. Thousands of owner surveys don't lie but they do provide some interesting insights. Each category was scored from 1 for the worst to 5 for the best. Cumulative scores were totaled for each model. Our research found models with a total score of 4.80 or better. Models with too few survey results were eliminated because we didn't feel those average scores would be accurate. Model years form 2001 thru 2017 are covered. Year and model are listed first, followed by the overall score. 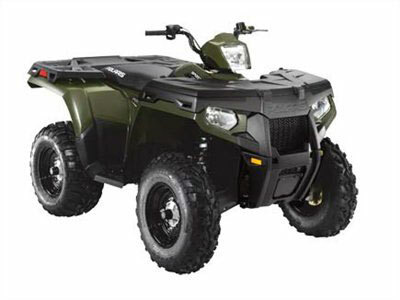 Sportsman 500 is the most popular used Polaris ATV model. The perfect score says a lot! Favorite features were ride, handling, and power. Not so favorite things were the weight (700lbs), and the variable locking front differential. Easily damaged footboards were a concern for a few owners. Good mudding ability was mentioned but radiator clogging and overheating were a couple of things to watch out for. Some owners called it a "tank" because of it's ability to tow heavy loads and plow in low range. Most owners mentioned outstanding reliability with only a few various problems after thousands of hard miles. Favorite things were the same as the 2001 model with several owners saying this is their second Sportsman and many others claiming they recommended Sportsman models to friends and other riders. Dislikes mentioned were the single linked braking system and the rear wheels only EBS (engine braking system). Easily damaged CV joint boots generated a few complaints. Overall reliability was listed as a plus. Owners actually seemed surprised by how well their Magnums performed. Maybe because of the smaller engine or lower price it's like they didn't really expect as much from this used Polaris ATV. There were a few who thought more power would be nice. Most were surprised how well the Magnum handled trail riding and work chores. Reliability was rated as excellent with no significant problems. We didn't really expect to see this model on the list, but would have to say it looks like the Magnum 330 over delivers! Starting to see that owners like the Polaris Sportsman 500? The 2004 model keeps it up with several owners declaring it the "best overall ATV". Everything wasn't perfect with a few complaints about the lack of fuel capacity and the seemingly delicate CV boots. This was still the highest rated used Polaris ATV utility model. This model had a short run, but strangely had higher ratings than either of it's replacements - the 700 and 800 twins. Owners liked the low end torque and fuel mileage of the 600. More complaints about CVT belts getting wet and slipping showed up with this model for some reason. Several still didn't like the EBS. As a best used Polaris ATV we don't know if the Sportsman 600 should be on the list due to concerns about replacement parts. Short run models sometimes aren't supported very well when it comes to parts supplies. But it definitely scored well enough to be included, so we'll let you decide. We just recommend a little homework on the parts situation before you buy one. Another Predator sport quad makes the list with an outstanding score! Guess all those "Sport Quad of the Year" awards weren't a fluke. The 2005 models came with a reverse gear, Fox double adjustable aluminum shocks, chromoly axle, and radial tires. Owner loyalty for these things borders on a cult! That shouldn't be a surprise - It just proves our point that a simple quad usually equals a reliable quad. And it doesn't get much simpler than a sport quad. Looks like the Polaris Predator has a lot of fans! It gets a lot of compliments on its' great all around performance. Dunes, tight trails, open trails, and all kinds of terrain in between are handled well by this sport quad. Most owners felt it was easier to ride and more forgiving than the all out racing 450 class quads. Reliability was also regarded as better due to the less high strung tuning of the Predator. The X2 adds the ability to take a passenger with you. Longer wheelbase and more weight than the standard Sportsman. Owners liked the good ride and stable handling of the longer wheelbase. A little tougher to get through tight trails but the turf mode rear differential does help. A very few complaints about rapid wear of the transmission belt, but the X2 was the highest rated Sportsman on the list. The Outlaw was the first sport ATV with an IRS rear suspension. Add the power from an engine supplied by KTM, and owners really loved this quad. Many mentioned the good ride, traction, and handling on rough trails as favorite traits. Complaints were fairly minor. Several said they thought first gear was a little too tall for tighter trails. A significant number had problems with the seat coming loose, but most had found a suitable fix for it. Owners appreciated the versatility of this long wheel base utility ATV. They liked the interchangeable passenger seat/dump box combination. The X2 is one of a few ATVs designed to carry a passenger, and that was mentioned as a big selling point. You would think with the availability of bigger engine models there would have been some dissatisfaction with the smaller 700 engine. But we found just the opposite with many owners stating they wouldn't need or want more power. We don't see very many perfect scores in these surveys, but owners absolutely loved the big Outlaw. Many also mentioned being a little intimidated by it, so fair warning. This is a serious go fast machine! The KTM engine makes big power and the Fox suspension helps put it to the ground. Judging by owners comments, the Outlaw seems to be equally at home on the dunes, trails, and motocross track. As a used Polaris ATV, it may have lost some edge as a racing ATV, but it should still be more than enough for most trail and fun riding. This is the first appearance of an XP model on our list. Interestingly, it's the 550 rather than the more highly touted 850. We feel at lest a little vindicated because we felt after testing both that the 550 was the better ATV for most folks. Owners mentioned the great balance of power and handling, the comfortable ride, and the ease of riding with the new electric power steering. Reliability and durability were also mentioned as favorite features of the 550 XP. Some thought the ATV was too noisy, and we noticed a few complaints about the clutch engagement. As competitive as the mid size class is, there were remarkably few negative reviews. We have started to include UTV models with the used Polaris ATV models due to their popularity. First time the RZR made the top of the list. Several owners report switching from ATVs to a UTV for the first time. Many admitted they had concerns about the durability of the larger UTV, but were surprised at the toughness of the RZR. Owners loved the ride and the power to pull and haul heavy loads over rough terrain. A few complaints about a sensitive throttle but most said they quickly adapted. It seems the 2 place 550 hit the sweet spot with owners. Very enthusiastic replies about overall satisfaction. Most owners used these strictly for recreational riding. The base model 550 seemed to be favored by owners looking for more utility than any other feature. They didn't want or need power steering and didn't seem to miss it. Several owners mentioned using their Sportsman for farm chores including plowing and towing. Others used theirs heavily for hunting. Oddly, not a single owner mentioned a lack of power with the smaller 550 engine. They did mention the simplicity and reliability of the design, as well as the extra comfort from having more room in the footboard and seat area. 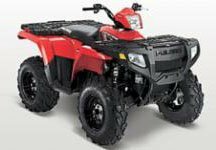 The most popular used Polaris ATV model continues to be the Sportsman, now with more model choices and engine sizes. From 2011 and newer, only used Polaris ATV models with a perfect 5.0 score will be listed. Owners mentioned the safety features and overall toughness, along with the good ride. Several called out the ability to handle rough terrain and even snow. Several replies said they felt the XP 900 was significantly ahead of the competition as reasons for their high rating. Owners loved being able to take more passengers with them. Most seemed to use the RZR 4 for recreational riding. They liked the ride and handling agility for a machine this size. Many responses saying this was the best sport ATV for handling the biggest variety of riding situations. From steep hills, tight trails, wide open sand dunes, and rough terrain, they felt the Outlaw worked the best. One of the most sought after used Polaris ATV sport models. Sportsman 500 continues to be an owner favorite. Comfortable ride and good durability are mentioned most often. People loved these! Especially larger riders that said they felt more comfortable on the 850 than any other ATV. Ride, handling, power, and the confidence in the machine to go anywhere were mentioned as favorite features. Several thought the big Sportsman offered better value for the price than other makes and models. All day riding fun is a common reply in the survey. Owners felt the RZR 800 had a combination of features that added up to a high level of overall satisfaction. Several replies noted the "fun factor" that made you want to keep riding all day. Power, handling, ride, and overall speed were all listed as favorite features. Reliability kept owners happy. The survey answers show that folks really use these Sportsman models. For just about anything you can imagine! They plow snow one day, go mudding the next, use the cargo capacity to load it up, and finish off with some trail riding. This used Polaris ATV is regarded a best value by many owners. Owners said they just felt this model offered a better value and features than any others in the category. Basically the same comments as the 2011 model. Power and plush ride were still favorites. Durability and the power of the 570 engine were listed as favorites. Several owners said they were surprised at how much abuse the RZR could take and keep going. We saw comments like "tank", unbreakable, etc. in reference to this model. It honestly sounded like some folks were trying to see how much abuse this thing would take. Judging from the perfect rating, it must have been a lot! The longer wheel base and cargo box/seat combo were favorites. This model gives you all the favorite features of the Sportsman 550 in a slightly larger package with even more versatility. Several people chose this model to transition from ATVs into a UTV. Most were surprised and impressed with the capabilities of the little Ranger. Good low end power was a favorite. The electric Ranger is a niche model, but owners were very satisfied with this one. There isn't a lot of competition in this segment, so we think most folks gave this one a top rating for the way it works. This one seemed to get high marks for being good at what it's supposed to be good at. Which is navigating tight, narrow trails at relatively low speed. Versatility and value were the most popular features. The 570 engines seem to be gaining fans, as several mention it as a notable feature. UTV models have become so numerous, we will cover them in a different article after 2014. A surprising result with the 325 ACE engine installed in a Sportsman chassis. Value price was a draw for many. Most owners felt the EXT had enough power to do everything they wanted, if just a little slower. Consistent comments about the good power versus engine size, and the comfortable ride. Several mentioned the good value for the price. Sportsman 850 models continue to be popular with owners. They liked the versatility of this touring version, along with the power and smooth ride. 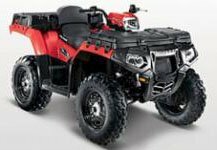 ACE models will be listed with other used Polaris ATV models. The 900 engine in the ACE chassis motivated owners to give this model the highest rating. Favorite features were power and handling. Power steering was considered a must have. Reviews were almost evenly split between those that liked the utility function and those that appreciated the recreational riding ability. No wonder the Sportsman is an overall favorite! Specialty model for ATV mud riding. But owners gave them the highest rating possible. Versatility was the favorite feature talked about in owner replies. They like the way this used Polaris ATV could work around the home, pull a trailer, plow some snow, and then go trail or mud riding. And perform well at all of it. Similar comments to the 850 model, only with more power. Owners felt invincible with the 1000, but also felt all that power was very controllable. Best Used Polaris ATV Models - Conclusion. There you have it. The best of the best in used Polaris ATVs. That's not to say there aren't other good choices in used ATVs, but the ones on this list are tops. We don't think it's any accident that so many of the mid size Sportsman models are on the list. There's no doubt it's one of the best utility models on the used ATV market. Return to Guide to Used ATVs from Best Used Polaris ATV Models.